Did you know that unicorns and mermaids actually have superiority complexes and are mega-jerks? If you have read the Sutherland sisters’ The Menagerie trilogy, then you know that and more! Logan Wilde and his father moved to Xanadu, Wyoming, back in the summer. After his mother sent them a postcard saying she has left them for a new job opportunity, Logan’s dad packed them up, quit his well-paying legal job in Chicago, and moved them to Xanadu. It is October now, and Logan has yet to make any new friends in school. His father also has yet to find his mom. So it is a big zero all the way around for the two Wilde men. One morning, Logan wakes up to find feathers scattered all over his room. His first thought is that his cat, Purrsimmon, had a midnight snack on the floor of his bedroom. Except his cat is hiding on the top shelf at the back of his closet, and she shredded his sweaters while she was up there during the night. His betta fish and pet mice are similarly distressed; the mice are hiding in a corner of the terrarium, and the fish is swimming madly about the tank. Confused, but in a hurry to get to school on time, Logan changes and grabs a Pop-Tart on his way out of the house. But he never checks under his bed to see if there is anything there…. On his way to school, Logan sees more feathers, along with damage caused by something all over town. To add to the perplexities of the day, he meets two of his classmates on his way to school: Blue Merevy and his friend Zoe Khan, the weirdest girl in school. Zoe looks like she is in the middle of a panic attack she is desperately hoping no one will notice. Blue, in contrast, is as cool as a cucumber. Logan asks what the problem is and Zoe says she has lost her dog. Logan offers to help her find it, but she dismisses his offer as politely as possible. The day gets weirder when he learns someone ate all the food in the school cafeteria. (Except the lettuce – that is virtually untouched.) But the day takes a turn for the magnificent when Logan gets home and finds a griffin cub hiding under his bed!!! Logan soon discovers the cub’s home is behind Zoe’s house. After sneaking in, Logan finds the place is a big zoo filled with mythological creatures: dragons, unicorns, griffins, hellhounds, a yeti – and a whole lot more! Zoe, however, is somewhat horrified to find the new kid from school has gotten into her family’s top-secret Menagerie. 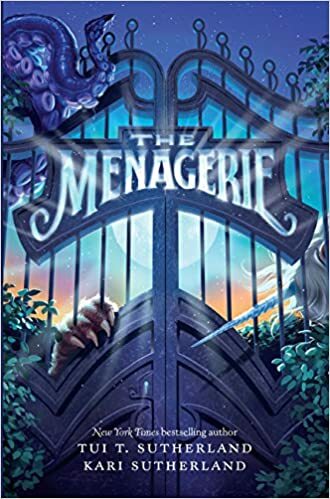 A bad experience with her older sister’s boyfriend has made her family crack down on absolutely ever letting anyone know of the Menagerie’s existence. The rules were already strict before this fiasco, but afterward, they are even tighter. How is she going to explain this to her parents?! The return of the griffin cub mollifies her somewhat, but it does not solve the problem entirely. See, Logan is only part of the problem. The bigger problem is that there are six cubs missing from the Menagerie. If any of the other five are spotted in town, the secret is out. And that will be THE ABSOLUTE END OF HER WORLD AND THE MENAGERIE!!!! One of the wonderful and frankly unexpected things I found enjoyable in this trilogy is that all but one of the characters comes from an unbroken family. Blue’s parents are divorced, but Zoe’s and Logan’s parents remain true to each other throughout the trilogy, as do their friends’ parents. 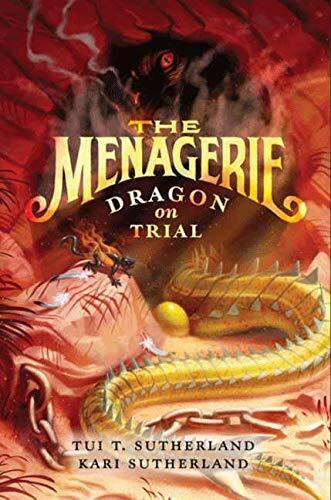 Since one of the writers is the author of the Wings of Fire series, where almost none of the main characters have an intact family, this is something of a happy surprise. It is nice to know the broken family cliché can actually be tossed aside by modern writers. It is a bit of an over-relied upon plot device in my opinion. These are all the tantalizing tidbits that you are getting out of me today, readers. 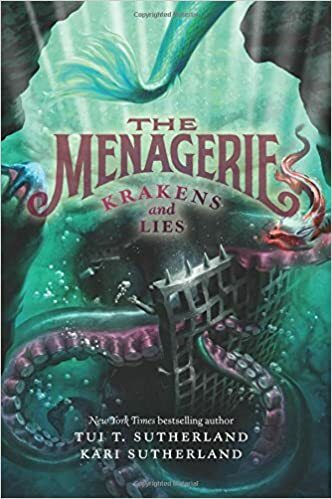 If you want to learn more, grab The Menagerie and its sequels – Dragon on Trial and Krakens and Lies as soon as you can. You will want to borrow all three books at once, because you will not be able to put these books down of your own free will. They are gripping! This entry was posted in Book Reviews, Youth Books and tagged Blue Merevy, Book Reviews, books for children, children, children's stories, Dragon on Trial, Dragons, fantasy books for children, griffins, Kari Sutherland, Krakens and Lies, Logan Wilde, mermaids, Modern children's books, sisters, The Menagerie, Tui T. Sutherland, unicorns, Wings of Fire, Wyoming, Xanadu, Youth Books, Zoe Khan on March 31, 2017 by The Mithril Guardian.